infraSECURE has two independent modules and works on a client server environment. The central console helps in deploying and managing power policies that suit the work environment of different teams in the organization. The intention of the architecture is to provide for best of both the worlds, GREEN Computing and Productivity. • Hibernates desktop computers (Microsoft's Windows XP SP2, Windows VISTA, Windows 7, Windows 8 and Windows 8.1) to save on power drained when computers are not in use. 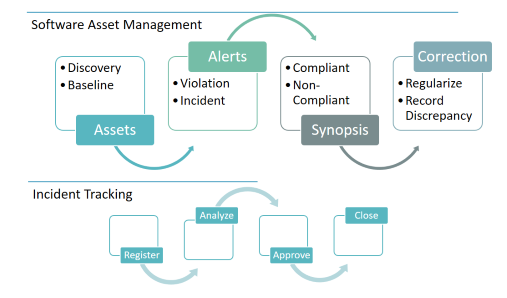 • Process Driven Software Asset Management helps you comply, audit, analyze and Optimize. • Mail trigger utility to send alerts are periodic intervals.